Oh dreidel, dreidel, dreidel, I used you for artic! 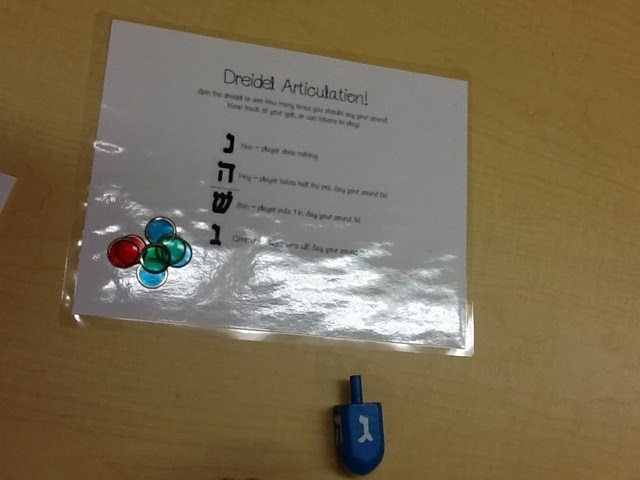 If you checked out my mega Hanukkah packet on Tuesday, or checked my #instacfy yesterday, you saw my dreidel articulation! Now, traditional dreidel game playing involves winning gelt - chocolate coins. Since I haven't had a chance to get to the store, we played for chipper chat tokens! Same concept, chipper chat tokens just definitely don't taste so hot...trust me. Anyways, this will be a freebie tomorrow if you're looking to grab your dreidel and play. If you'd like the entire language packet for Hanukkah, check it out in the post right below this one!